With ever-expanding technology, it is always beneficial to find ways to use materials created in areas such as engineering for secondary purposes, such as training. An example of this is the engineering model for a new construction or expansion project. 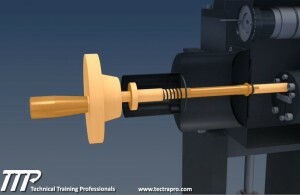 Used for everything from concept design to material fabrication, a 3D model is a standard tool in today’s engineering. 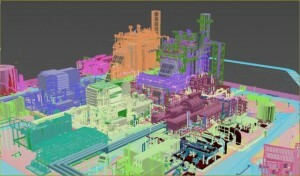 These models, coupled with faster, more advanced computers and software, give training providers the ability to create detailed 3D content showing information previously only visible in 2D simplified views in books, brochures, outage photos and artist renditions. Additionally, by using site models, the training content is site-specific, which is key to any successful training effort. The retirement of workers from the post-war “baby boom” is one of the most important demographic shifts facing industrial America, and the power industry is no exception. Companies have spent years addressing this issue, resurrecting training and qualification programs for the first time in decades, preparing for the workers who will replace the boomers. Members of the millennial workforce, or 18- to 25-year-olds currently entering the workforce, are accustomed to multimedia content that quickly explains everything from Sudoku games to interstellar travel. Much of this content is instructional and can quickly show how things work or how tasks are accomplished. Add the immersive gaming world experiences of this generation, and it is no surprise that the same techniques are seeing strong success in the power industry. Leveraging site engineering models, along with the ability to draw and create realistic equipment internals, is the first step in creating this training content. 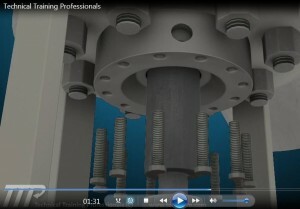 Once accomplished, it becomes possible to create very intuitive 3D videos with highly illustrative cutaway graphics. Layered, interactive equipment graphics can be exported in common file formats, such as portable document files (PDFs). These 21st century graphics also enhance e-learning solutions, as well as more traditional training manuals and books. 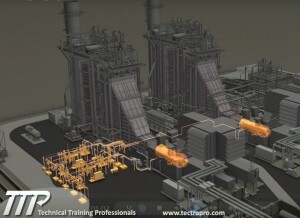 One of the challenges faced in creating this type of training is locating the employee who can take highly technical engineering content and turn it into a 3D virtual world. The answer is in the gaming community. Already trained in creating graphic-intense virtual reality worlds, these wizards are able to translate these skills into the power generation world. Gamers, 3D modelers, videographers and artists from the nation’s art schools collaborate with power industry subject matter experts to develop compelling visual content. Whether explaining stress corrosion cracking, reverse osmosis or flow through a Heat Recovery Steam Generator (HRSG), it has been proven time and time again that the majority of people are visual learners. “Visual Presentation of Technical Information” allows trainees to easily grasp complex subjects while feeling empowered by their ability to far more easily grasp complex subjects. Also, Calpine has found that the 3D content created is very useful as a training aid to operations, maintenance and engineering support personnel who are being provided technical training. In addition, safety training on topics ranging from “Arc Flash” to “Forklift Training” and “Site Hazard Overviews” is far more engaging when presented with detailed 3D models and live video. Perhaps the most important aspect of these training solutions is that they graphically show a company’s commitment to employee development. Whether an employee is transitioning from a coal plant to a gas-fired plant or starting work in the power industry, the ability to see step-by-step explanations is extremely valuable. Seeing the flow paths and design in 3D with related control screen depictions provides the needed training in a more understandable manner to trainees. One example that can be demonstrated is the firing modes of a combustion turbine (CT.) The screen shown below demonstrates how walls, structural steel and other items can be made translucent or invisible, enabling trainers to clearly show gas control valves, gas supply headers, burner internals and the corresponding portion of the control screen. Chemistry control is crucial to overall plant health, but the underlying processes can be a challenge for plant staff to master. Reverse osmosis (RO) is a good example. The graphic below shows how 3D graphics can easily show the rejection of hydrated chloride and sodium ions due to their larger size, while lone water molecules can pass through the RO membrane. 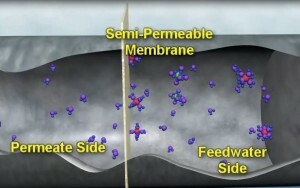 Once this simplified concept is understood, trainees then understand that the membrane is basically a molecular filter. 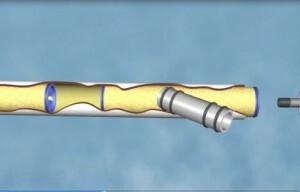 From this point, it is easier to understand why certain gases, such as non-ionized gases that do not hydrate in water, easily pass through the membrane while ionized gases are rejected. 3D visualization can also be very helpful in explaining electrical concepts such as ground fault protection relays, power factor and other concepts that plant personnel sometimes struggle to understand. This is accomplished by showing the actual current transformers, breakers and other contents while “flying through” buildings and transformers. 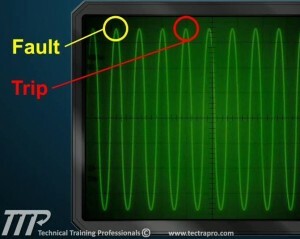 This content can clearly illustrate what causes a relay to activate. Memory retention is better when trainees “see” the devices than when they are just shown out-of-sync sine waves and other 2D representations. Training on maintenance procedures is probably one of the largest growth areas for this technology. 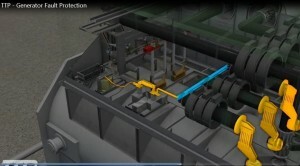 Not only do maintenance people welcome step-by-step, detailed 3D procedures on topics such as rebuilding actuators, they also appreciate the ability to go quickly to any step and see linked items such as information from vendor manuals, rebuild photos, notes from co-workers or even part numbers. Another application of this material is in the area of site safety and site orientation. Gone are the days when contractors are shown a canned video followed by a talk-through of the site’s general arrangement drawing. 3D site fly-through videos provide an overview of the site, the functions of its major components and the locations of site hazards in a way that is engaging and memorable. The 3D videos can be leveraged for contractor orientation, new employee orientation, site safety instruction and even to explain the plant’s design and function to the public. An easily understood explanation that the plume from the cooling towers is steam, not smoke, can be very helpful in educating the public and gaining acceptance of a new facility. 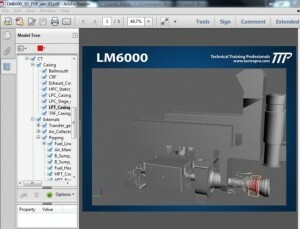 For classroom training purposes, not only can the 3D animations be leveraged, but 3D PDF files derived from previously created models can be used by trainers to remove equipment “layers.” Each layer can illustrate selected systems or even identify specific components (valves, temperature elements, etc.). The 3D PDF files can also be very useful to Control Room operators to clearly show the location of a valve or other flow element. The 3D view can also show the physical location of the valves that will be used to isolate the element for the tagging process. Further innovations are available that enable an operator can click on a control-screen depiction of a component such as a valve, breaker, controller, temperature indicator or other device graphic to request to see its physical location. In addition, an operator can then choose to see the full system, such as feed water supply to the HP drum from the boiler feed pump (BFP), HP steam circuit, etc. This can be a real time and cost saver that eliminates the need for operators to search vendor manuals, paper files and other references. One tool that is becoming quite attractive is a Learning Management System/Collaboration site that allows presentation of all 3D content as well as the ability to sync all related reference data for a given piece of equipment such as a CT or BFP to a smart device. If maintenance personnel are going out to work on the CT, they can synchronize all related 3D training, vendor manuals, the most recent piping and instrument drawings, updated electrical schematics, thermo graphic data, walkdown sheets, previous inspection reports and other relevant materials. 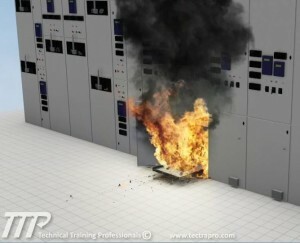 Once the person returns to the control room, they can then re-sync the smart device with the server, thus updating completed training records, inspection reports, and so forth. As this content is created, a large company can compile content among plants, updating specifics for each site as well as information common to several plants. 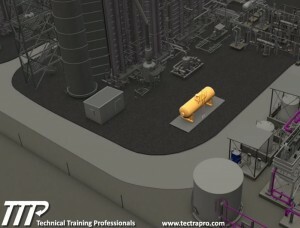 If the same power block major equipment, such as CTs or HRSGs, is used, high-quality, site-specific training featuring 3D content can be created at a very reasonable cost. 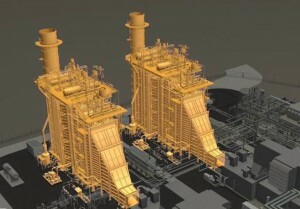 Calpine recently had the opportunity to implement the use of detailed 3D models and animation of those models for two projects. 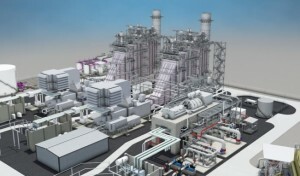 Both are combined-cycle facilities – the new Russell City Energy Center (Hayward, California) and the upgraded Los Esteros Critical Energy Facility (Milpitas, California). 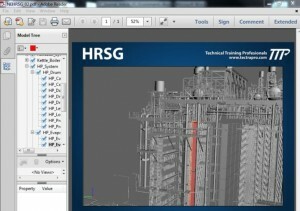 In both cases, 3D site models were created for engineering functions and were referenced to create training content. Additionally, some manufacturers were willing to partner with the content provider, Technical Training Professionals, to provide detailed 3D equipment models in return for access to content created from the models. A major example was Nooter Eriksen (NE). NE provided the engineering model for the Russell City HRSG. By allowing the use of this model in content creation, NE was provided with the courses, as well as future boiler cycle chemistry courses in which its HRSG will be featured. With such collaboration between owners, equipment and training content providers, all players win. 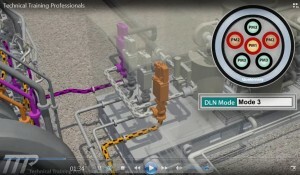 Calpine has leveraged the training animations beyond employee training. One significant example is in the investigation of plant events. Employees and contractors involved in one investigation were able to better visualize equipment issues, resulting in more detailed and comprehensive investigation findings. The animations have also been used during job briefings as part of complex construction and outage work. Finding more than one use for an existing asset is a tried and true method for showing return on investment. The area of improved maintenance activities is one example. When the end result is an investment in Calpine’s greatest resource, its people, the ROI is substantial.